The formation of the government of little-known prime minister and former irrigation minister Hisham Qandil was almost completed on Wednesday. There were few surprises. The first one was that Field Marshal Hussein Tantawi retained his influential position as defense minister. There had been rampant rumours that Tantawi, who is also chairman of Egypt's Supreme Council of Armed Forces (SCAF) – which took over after former president Hosni Mubarak's ouster in February 2011 – would be kicked upstairs to a vice presidential post. The biggest surprise was that Major-General Ahmed Gamaleddin was appointed new interior minister instead of Mohamed Ibrahim, who stayed in office for eight months. When named prime minister for the first time last week, Qandil said that a new interior minister would be appointed. Ibrahim himself said he would not stay in office after facing "a difficult time" as interior minister. Gamaleddin was appointed director of Egypt's Public Security Authority in the place of Adly Fayed, who served under Mubarak and his former interior minister, Habib Al-Adly, who was convicted of manslaughter and is currently serving life imprisonment. Gamaleddin managed to forge close contacts with Muslim Brotherhood MPs over a six-month period, after which the People's Assembly (the lower house of Egypt's parliament) was dissolved. Gamaleddin agreed with deputies that the interior ministry is in desperate need of restructuring and that utmost priority should be given to fighting criminal activity rather than cracking down on political activists. Qandil's new government was welcomed by the US. Fayza Abul-Naga, the forceful minister of international cooperation and planning, left office after almost 12 years, ten of which were under the Mubarak regime. Abul-Naga had led a clampdown on NGOs accused of illegally obtaining foreign funding. The US media expressed joy that Abul-Naga had left office, arguing that this would pave the way for Washington to resume its economic and military assistance to Egypt – estimated at $1.7 billion per year – and even write off some $1 billion in debt. Several US officials visited Cairo in recent days, with all of them expressing satisfaction over the progress of Egypt's democratic transition and the performance of the newly-elected President Mohamed Morsi. It is not clear who will replace Abul-Naga, who on Wednesday issued a report on her achievements as minister over the last year. Six ministers from the outgoing government of former prime minister Kamal El-Ganzouri will retain their portfolios. These include Foreign Minister Mohamed Kamel Amr; Finance Minister Momtaz El-Said; Social Insurance Minister Nagwa Khalil; Scientific Research Minister Nadia Zakhari; and Antiquities Minister Mohamed Ibrahim. The above shows that so-called 'sovereign portfolios' – including those of defence, interior, foreign affairs and finance – will be kept out of the hands of Muslim Brotherhood figures. 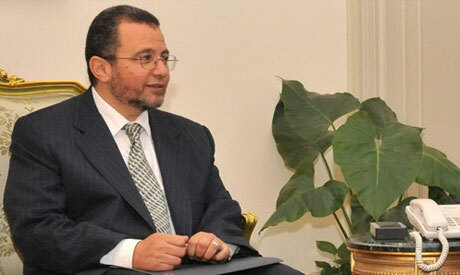 It was rumoured that senior officials of the Brotherhood's Freedom and Justice Party (FJP) – such as Essam El-Erian, Mohamed El-Beltagi, Saad El-Husseini and Hussein Ibrahim – would be in charge of most sovereign portfolios, including those of the highly-sensitive security and defence sectors. It is also an indication that the Qandil government will be more technocratic than Islamist. Some political analysts, including Diaa Rashwan of the Al-Ahram Centre for Political and Strategic Studies, believe that the FJP has opted to stay out of the Qandil government. "They might believe that it's better to wait until new parliamentary elections are held and a new government formed," said Rashwan. Qandil's government includes a large number of new faces, most of them technocrats that have long served as state employees. President of the moderate Al-Azhar University Osama El-Abd, rather than fiery Salafist preacher Mohamed Youssri, was appointed minister of religious endowments (Awqaf). Cairo Governor Abdel-Qawi Khalifa, meanwhile, was appointed to head up a new portfolio: the ministry of utilities, drinking water and sanitary drainage. Qandil has said this ministry was created to give an early indication that his government's utmost priority was solving the daily problems of ordinary citizens, who have long complained of inadequate infrastructure. The Qandil government includes one Coptic-Christian figure, Scientific Research Minister Nadia Zakhary. Mounir Fakhri Abdel-Nour, the former Coptic tourism minister, opted to leave office after his liberal-oriented Wafd Party declared its refusal to join an Islamist-led government. Hisham Zazaou has been appointed in Abdel-Nour's place. New faces also include Tarek Wafiq, who replaced Fathi El-Baradie as minister of housing; Osama Kamal, who replaced Abdallah Ghorab as minister of petroleum; and Ahmed Zaki Abdeen, former Kafr El-Sheikh governor, who replaced Mohamed Attia as minister of local administration; and Salah Abdel-Momen, who replaced Mohamed Ismail as minister of agriculture. Alaa Abdel-Sadek, manager of the Enpi football club, was appointed minister of sports. Only three ministers belong to the FJP: Mostafa Mosaad, former FJP education official, was appointed education minister; Tarek Wafiq, head of the FJP's housing committee, was appointed minister of housing; and Osama Yassin, the FJP's chairman of the dissolved parliament's youth committee, was appointed minister of youth. It was also rumoured that Mohamed Ali Bishr, a high-profile Muslim Brotherhood figure, would be appointed minister of electricity. Instead, however, Mahmoud Balbei, chairman of Egypt's Holding Electricity Company, was appointed to the position. It had further been rumoured that prominent FJP figure Hussein Ibrahim would be appointed minister of parliamentary affairs. Instead, however, the independent Mohamed Mahsoub, member of the moderate-Islamist Wasat Party, was appointed to this portfolio. Mahsoub, a professor of constitutional law at Menoufiya University, is currently a member of Egypt's Constituent Assembly, tasked with drafting a new constitution. Qandil, who had formerly served as irrigation minister, was replaced by Mohamed Bahaaeddin, who had served as senior undersecretary of the irrigation ministry. Mohamed Rashad, professor of roads and bridges at Cairo University, was appointed transportation minister. Abu-Zeid Mohamed Abu-Zeid, deputy chairman of Egypt's Holding Company for Food Industries, was appointed minister of supply and internal trade in the place of leftist economist Gouda Abdel-Khaleq. Rashwan's initial impression of Qandil's cabinet is that it represents a technocratic and bureaucratic, rather than politically-oriented, government, especially after most non-Brotherhood political forces opted out of joining it.